At its best, The Events is a brilliant, swirling rush of inquiry, speculation and metaphor. “It’s best” probably constitutes between 80-85% of the running time. There’s room for a further edit, though. An extra cutting away of the more “normal”, “fixed” elements would make it fly. As it is, it’s still a deeply intelligent, and frequently exhilarating piece of work. At the outset, The Events seems inspired by Anders Breivik’s murderous rampage on Utøya in 2011. Here the event(s) in question is/are the massacre of a “multicultural” choir somewhere in Britain. But for every detail and piece of precision that Greig drops in, the mind almost immediately recalls or imagines the many analogous situations. As well as Utøya, the ghosts of Dunblane and Lockerbie feel particularly present watching it here in Scotland. This exciting interplay between specificity and symbol is exploded by Ramin Gray’s effortlessly European production. The first and most obvious stroke of genius is the casting of Rudi Dharmalingam (last seen in the excellent McIntyre/Donnelly Seagull) as “The Boy”. The Boy is only one of two “characters” in the text. The other is Claire played with a beautiful, nuanced sensitivity and warmth by Neve McIntosh. There is also a small choir on stage with the actors (maybe 15 on Sunday’s press performance – there is a different choir every day). The Boy actually takes on a number of roles, from Claire’s counsellor and girlfriend through to the Breivik-alike neo-fascist gunman. The reason that having him played by a British-Asian actor (in a production directed by a British-Iranian director) is so good, is partly that it diffuses that appalling sensation of watching someone deliver racist speech after racist speech with great charisma and clarity from the largest stage of a national theatre. You can listen to the rhetoric and at the same time marvel at the totality of the disconnect between speaking and sentiment. By the same token (while I have no idea of Dharmalingam’s specific background), just the fact of his non-white-ness also reminds us of other terrorists in other parts of the work, perhaps deliberately critiquing the fact that when the Norway massacre took place, many newspapers immediately leapt in with presuming-Islam-to-blame headlines. 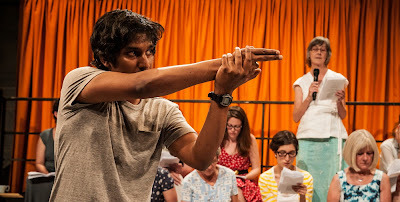 There’s an interesting thing that happens when acutely intelligent left-liberal playwrights write plays about racist, neo-Nazis fundamentalists (although The Boy is les fixed in his identity than this). And the thing is: left-liberal playwrights usually manage to construct much better arguments than neo-Nazis ever do. Early in The Events The Boy describes an aboriginal boy watching the first ships from England approaching the shore of Australia. “If you could go back in time and speak to that boy, what would you say? And we, the (mostly, I assume) liberal audience of the play, are that “You”. We are presented with a classic liberal dilemma. Because we know The Boy isn’t really talking about aborigines, he’s drawing an analogy with the – as neo-Nazis see it – threatened death of Western European culture, usually, specifically at the hands of Islam, but more generally at the hands of “multiculturalism”. But we also recognise that, yes, we probably would advise Australian aborigines, and native Americans, and etc. to vigorously, violently resist white Western imperialism. Of course we know that beyond this, “Western culture” is not under threat from “multiculturalism” or “creeping Islamification”. But it’s Greig’s talent as a dramatist that makes us understand all to clearly how this neo-fascist thinks. How thin the membrane between his defenceo f what he sees as his birthright and we what’re happy to understand as the stolen, destroyed birthrights of the conquered and enslaved peoples of history. Elsewhere, I think Greig is on a less interesting path with his inquiry into “evil”, and The Boy’s speech in which Arendt’s banality of evil becomes Greig’s, well, the dopeyness of evil with The Boy offering the strikingly lame conclusion that the shooting took place because: “I think I just got a bit obsessed with the [vikings/aborigines]” (the former is what I remember him saying, the latter is what the printed text has). Perhaps it’s just the way this scene is played by Dharmalingam, but here you don’t get a sense of someone who has done the shooting at all. Perhaps this short-circuiting of expectation is useful, though. Perhaps the only way of side-stepping our expectations. Although given Breivik’s ongoing commitment to his actions, it seems a bit of a cop-out. Beyond the ideas which the piece animates and explores, one of the chief pleasures of The Events is ATC’s production itself. Apparently the process of the commission was one which involved the play turning up in fragments, and then being shaped by either Greig, Gray, perhaps the two dramaturgs credited in the programme-script Oda Radoor and Brigette Auer (although they may equally just be the building-dramaturgs attached to the production from the co-producers Drammatikkenshus, Oslo and Schauspielhaus, Vienna), or a collaborative combination of all the above – perhaps with additional input from the actors, designer Chloe Lamford and others. Alongside the openness of the production style, there is something of this writing process recognisable in the “final” “product”. Chloe Lamford’s design is also another knock-out – essentially a bare stage with a rostra for the choir to stand on, a piano, two dozen plastic chairs, a tea urn and cups on a table at the side and an orange curtain which is flown up at the start and flown out at the close of the piece. Indeed, the beautifully artful artlessness of such a design echoes earlier Ramin Gray greatest hits like Motortown and The Ugly One, while the presence of the choir suggests his passing acquaintance with Karin Beier’s production of Das Werk, while at the same time confirming that Lamford can work in mediums other than the fold-out wooden box (a relief, since cubes-on-stage must surely be nearing their sell-by date now. Can Grounded be the last one for a bit, please? Let it go out on a high...). Actually, it’s worth taking a moment just to praise the proportions of the design. These things aren’t accidents, right? So the way that the playing area is really precisely demarcated by the width of the rostrum and the distance from it that the piano is placed just so, it closes up a trickily large stage while appearing to have done nothing so much as to place some necessary elements willy nilly. It’s bloody brilliant, frankly. You only need to go and see a less well designed show in Traverse One (both the others that I’ve seen, frankly) to appreciate how much you can lose an actor in that space. So, to conclude, and post this horribly over-long ramble – boy do I look forward to reviewing it elegantly when it comes to the Young Vic later this year – The Events is, for my money, a rather brilliant example of British European-ism. It’s not perfect, and it might well yet improve further, but it reminds us that Ramin Gray is one of Britain’s most effortlessly stylish directors, that David Greig is still an outstandingly intelligent and insightful experimental playwright and that Chloe Lamford should increasingly be thought of alongside the Tom Scutts and Johannes Schutzes of this world.